My ALL ELF Face of the Day! Hey everyone! Happy first day of Spring! Hope the weather is nice where you are. Today I was getting ready, and I put on a couple of face products, and they both happened to be from ELF. Once I realized that, I thought- I should use ONLY ELF products on my face today! There are a few reasons why... I mean, I have a lot of ELF makeup, and the brand has really expanded over time to offer so many different products. The fact that it's available at Target has caused me to pick up lots of different items to try! I don't think everything in the brand is perfect (I've yet to find a brand where I love absolutely EVERYTHING), but to those who think makeup has to be high-end in order for it to look good... I must say, you can save a lot of money and still look great wearing ELF stuff! :) Keep in mind, I'm currently reviewing some of the products I used today, so this is not necessarily one big list of recommendations. I've marked products that I plan to review as "under review". Also- this blog is not sponsored by ELF... I purchased everything myself. ELF products are available at Target or eyeslipsface.com. At the very end of my makeup routine, I used the HD powder and then the Mist & Set (under review). I swirled a large powder brush in the warm bronzer to combine all the shades and dusted that all over my face. With my fingers, I blended the cream blush into the apples of my cheeks (under review). To enhance the staying power, I dusted a coordinating powder blush on top of the cream blush. The Healthy Glow bronzer has some shimmer- I often like to use this to warm up my neck/collarbone area. From the eyeshadow palette, I used a light pink on the inner part of my lids and under my brow. I used a deeper rosy pink on the outer part of the lid, and blended it up into the crease, along with just a hint of purple. I used the navy blue cream liner (under review) on my upper lashline, and the outer part of my lower lashline. I lightly applied some navy shadow over the top. The one ELF product I don't have right now is MASCARA! :( So I had to use another brand for that. On my lips, I used the rosy colored Moisture-Care lip color... lightly blotting the shimmery light pink shadow on top for some added glow. Thanks so much for stopping by my blog! Again, any product that says "under review" is something I'm currently testing, and plan to reviw it soon! :) Many of the other products have already been featured in reviews here and there! Have a great day! You look gorgeous. Really shows that it doesn't matter the price of the products. I used the mineral eyeshadow in royal, blushing rose blush, and the eyelash curler! You're awesome! I love E.L.F products and have a lot of the studio and mineral line stuff. I've tried their mascaras several times and they've always been DRY! One of the only things I will not buy from them again. What did you think of their mist & set? I have it, but haven't tried it yet. I love my MAC fix plus. But I will get around to trying theirs. LOVE their gel liner, primer, blush, bronzer, HD powder and tinted moisturizer! Gorgeous!! Love the colors and your skin looks amazing! Now I want to try ELF products! ooooo :( we don't have the cream blushes in the UK :( NOOO! Lovely look Emily as usual!! I am so happy that you did this for us & can't wait for the review. Was hoping you would do an all ELF Face some day! I love their products & am so addicted to ordering from them. They have great coupons, fast ship & great products for a wonderful price! You look great. I love that elf is so affordable, and looks so good. I love ELF too, I don't know if you have a K-Mart near you, but they are carrying ALOT of ELF Studio. I love the ELF smoky eye and bright eyes for Spring the colors are beautiful! As a mom of a teenager I love ELF ! We just purchased tons of items during the 50% of the Studio Line sale. Great way for her to try out different things that don't break my bank. Oh YES!!! Finally an all ELF review!!! Thank you Emily!!!! I am putting in an order today! YES finally an all ELF face review!! I love ELF!! I am so getting all of this! I adore ELF, as a teenager these products are truly amazing and inexpensive. Which a low budget make up buyer wants! I know I do. 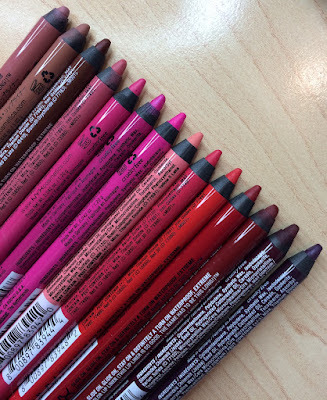 One question, is the Eyeshadow paletter worth buying? I know it was 10 dollars, but I am thinking of buying it. What do you think? Emily I will say that I am okay with the ELF mascara, BUT, it doesnt last but a week! The waterproof is better BUT it flakes! So for a buck!!!!!!! Worth it!!! You are looking amazing Emily. Hi, Emily. I always enjoy getting your blog feeds! ELF is one of my favs not just for the makeup but for the low cost. Love the look you did! I use at least one ELF product every day. Love the concealer, the bronzer/blush duo, and I am obsessed with every single one of their lip products. I just ordered the Day to Night quad from the essentials line because you sounded so pleased with it. i love that you did an ELF post. i feel like they dont get featured enough in beauty blogger's worlds :) i just did an ELF post too of their blush/bronzer duo and their eyelid primer. 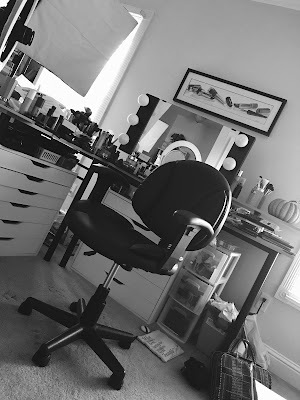 please check out my makeup blog when you have a moment! thanks! I love ELF. I have the same eyeshadow pallette and I am constantly amazed at the great color combos I can get. I love elf. The product that I have (blush, bronzer, gel liners) work well compared to other brands of make up. Love the price point as well. just last night i bought zit zapper and tinted moisturizer of e.l.f from target ..but sadly the store i visit doesnt have lots of e.l.f products . Can't wait for the review. Im new to the ELF line and am slowly building my stock of their makeup. Was wondering if you could do a tutorial on this look and/or one on the cream shadows. I love the look of them but im really afraid to try cream. I really like all of these colors.You really look pretty. Really glad that I found your blog! Lovely as always. You are such an inspiration !! Beautiful and Gorgeous looks are women biggest assets. I have just discovered tinted moisturizer through your you tube videos. Can't wait to see what you think. Do you have a favorite tinted moisturizer? Hi Emily, I just want to say how much I love your videos and articles. I am so glad I found your sites. I too love makeup. I have a few ELF products and also their brushes which I really like. I have two of the powder blushes which I like but the packaging is not very good.....took me a few minutes just to get it open...LOL!!! Thanks for sharing all your tips and tricks with us. Gorgeous! I really am loving the products from Elf that I've tried so far. I just scored a bunch of their products on sale this week and can't wait to try them all out! I'm really loving your blog btw, I just recently came across it and I'm so glad I did! have you ever tried the liquid concealer and highlighter? let me know if this is a great value product or not because I never tried any other brand liquid concealers. let me know! I love that you review elf, a lot of bloggers only prefer high end when so many people can't afford to be buying it all the time. Love your youtube videos keep up the good work! I love that you review e.l.f and not just the high end brands. e.l.f is great, some things can be hit and miss (like their nail polishes) but mostly great value for money. Love your youtube videos - keep up the good work. Loved your Elf collection! My favourite is: The glow bronzer. Keep up the good work.